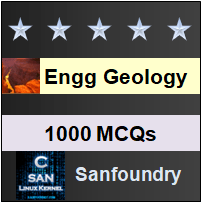 This set of Engineering Geology Multiple Choice Questions & Answers (MCQs) focuses on “Effects of Faulting”. 1. What is the effect of faulting on outcrop? Explanation: Faulting is essentially a process of rupturing and displacement along the plane of rupture. Its effects may involve- changes in the elevation of the ground, omission of some strata where they are normally expected, repetition of some strata in a given direction and displacements and shifts in the continuity of the same rocks in certain regions. 2. What is the effect of strike faults to the strata? Explanation: Strike faults are those, which are developed parallel to the strike of the outcrops. These faults produce, besides other changes, two pronounced effects on the outcrops repetition and omission of strata. Explanation: Repetition of the strata occurs, when the downthrow is against the direction of the dip of the bed in which faulting has taken place. 4. When the downthrow is _____________ direction of the dip, it leads to omission. Explanation: Omission of the strata takes place in a strike fault when the downthrow is parallel to the direction of slip of the faulted bed. 5. What has to be studied at first to tell about the effects with certainty? Explanation: It is only after the study of geological maps that existence of faults at the first place and their effects on the rocks may get established with some certainty. Explanation: In dip faults which occur parallel to the dip of the outcrop, the most prominent effect observed after faulting and erosion of the upthrown block is horizontal shift between the two parts of the outcrop. 7. Which fault causes offset? Explanation: Oblique faults cause an offset in the sequence, which is associated with either a gap or an overlap depending upon the downthrow direction. 9. What will result in an offset with overlap? Explanation: Oblique faults with downthrow to the left side result in an offset with an overlap. 10. What will result in an offset with gap? Explanation: Oblique faults with downthrow to the right side result in an offset with a gap. 11. Effects of faults in different types of folded strata is same as dipping strata. State true or false. Explanation: The effects of faults on different types of folded sequence is broadly the same as in plainly dipping strata. But with changes in the altitude of the faults or that of rocks, quite complicated results may be seen. 12. What is the effect of faults on topography? Explanation: One of the main effects of the faults on topography is that they very often result in the development of distinct types of steep slopes which are aptly called fault scarps. Explanation: Three types of fault associated scarps are often recognized: fault scarps, fault-line scarps and composite-fault scarps. Explanation: When a given slope is believed is believed to be the result of both of these processes, fault scarp and fault-line scarp, the scarp is of composite type, and is called composite-fault scarp. Explanation: In the fault-line scarp, the relief is produced due to process of unequal erosion along the fault line with the passage of time.